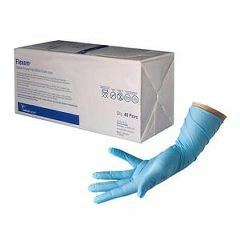 AllegroMedical.com presents Flexam® Sterile Nitrile exam gloves which are ideal when you require a longer length and/or sterile glove for exam procedures. The unique qualities of this product will provide you with a sterile hand covering that is synthetic thus addressing the needs of the latex sensitive and clinically reactive individuals. Textured fingertips for improved grip. Better puncture resistance than a comparable natural rubber latex exam gloves. Tested for use with Chemotherapy Agents and Lab Chemicals. 11-1/10" length, 5.5 mil average thickness. Single glove is packaged in an inner wallet in multi-Vac package.